After a four-day official visit in the United States of America, US Refuses to Sell Arms to Nigeria, President Muhammadu Buhari will be returning to Nigeria today with no pledge of concrete military assistance against Boko Haram terrorists from his hosts. The US government told the Nigerian leader that its arms are tied by an American law, the Leahy Act, which prevents it from selling arms to countries with human rights abuse records. President Buhari, who is returning home displeased, told the US government that the refusal by America to arm Nigerian troops because of “so-called human rights violations” and “unproven allegations,” would only help Boko Haram. A global human rights watch group, Amnesty International, had recently accused the Nigerian military under former President Goodluck Jonathan of gross human rights abuses in the prosecution of the war on terrorists. The Nigerian military forces had denied the allegation which President Buhari pledged to investigate. Buhari “departs with little practical military assistance in his battle against the Islamist militants who have turned the northeast of his country into a bloody war zone,” the Associated Press (AP) reported on Wednesday. The US government has vowed to help Nigeria defeat the insurgency but it is prohibited under law from sending weapons to countries that fail to tackle human rights abuses. 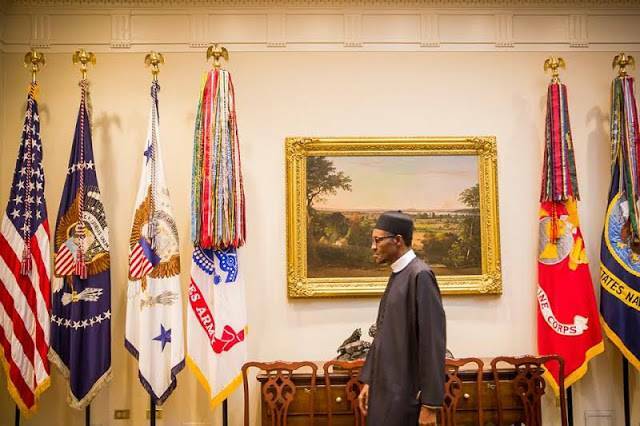 “Regrettably, the blanket application of the Leahy Law by the United States on the grounds of unproven allegations of human rights violations leveled against our forces has denied us access to appropriate strategic weapons to prosecute the war,” Buhari said. Addressing an audience of policy-makers, activists and academics in Washington, Buhari complained that Nigerian forces had been left “largely impotent” in the face of Boko Haram’s campaign of kidnapping and bombings. “They do not possess the appropriate weapons and technology which we could have had if the so-called human rights violations had not been an obstacle,” he said. Since 2009, Boko Haram has been trying to establish an Islamist breakaway state in a conflict that has seen 15,000 people killed and 1.5 million displaced. The group’s brutality and in particular the mass kidnapping and enslavement of schoolgirls has shocked world opinion. 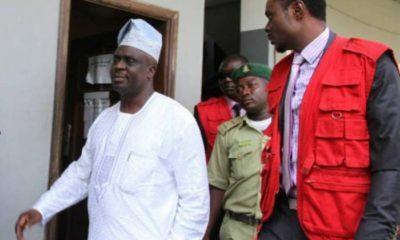 In June, rights watchdog Amnesty International said there was sufficient evidence to launch an investigation into senior Nigerian officers for war crimes. In a 133-page report, the group blamed the army for the extrajudicial execution of 1,200 people and the torture or arbitrary detention of thousands more. Buhari insists that the charges are not proven, but he has replaced his senior military commanders and has promised to investigate the allegations.